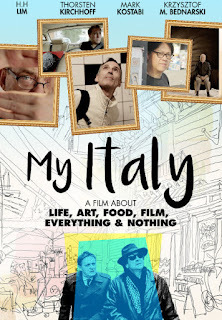 In theaters and On Demand Nov. 7 from Uncork'd Entertainment "My Italy," a film about a life, art, food, film, everything and nothing. A director and his assistant are traveling around Europe to seek financing for a film with and about four international artists: Polish Krzysztof Bednarski, Danish Thorsten Kirchhoff, American Mark Kostabi and Malaysian H.H. Lim; all of them stars from the world of art and in love with Italy. Hilarious and quirky, we follow the carnival of madness around the Italian countryside.